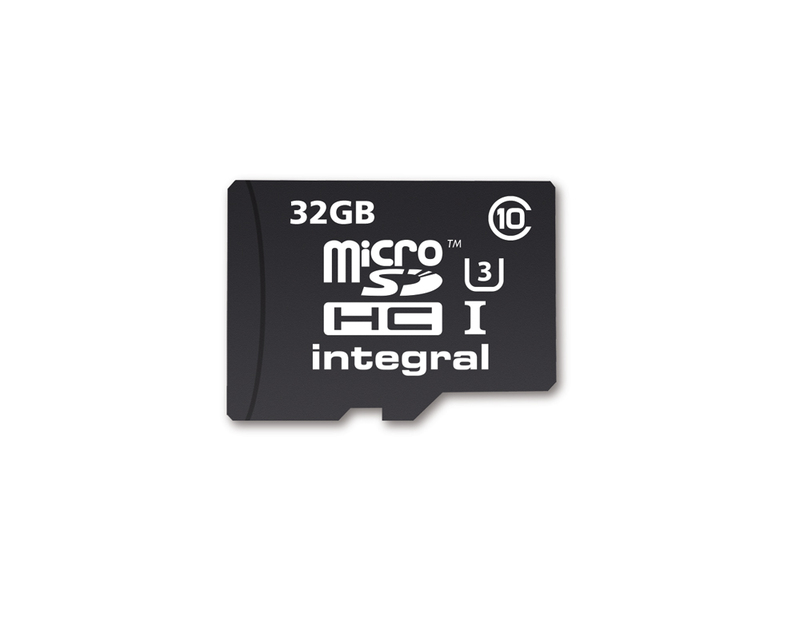 Action Camera microSDHC 32GB Class 10 UHS-I U3. 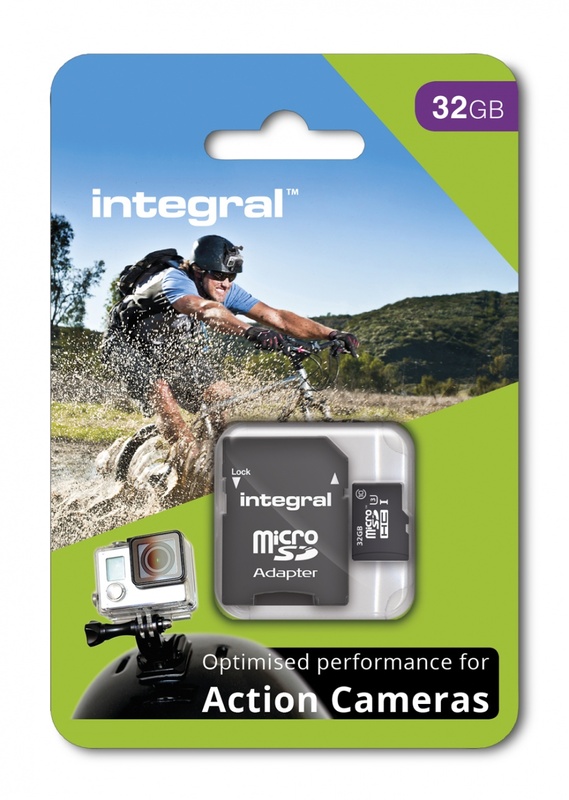 Integral's Action Camera memory card microSDHC and microSDXC Class 10 memory cards are ultra-high-speed and ideal for use in compatible action cameras (like GoPro®), smartphones, tablet PCs, digital cameras and camcorders. 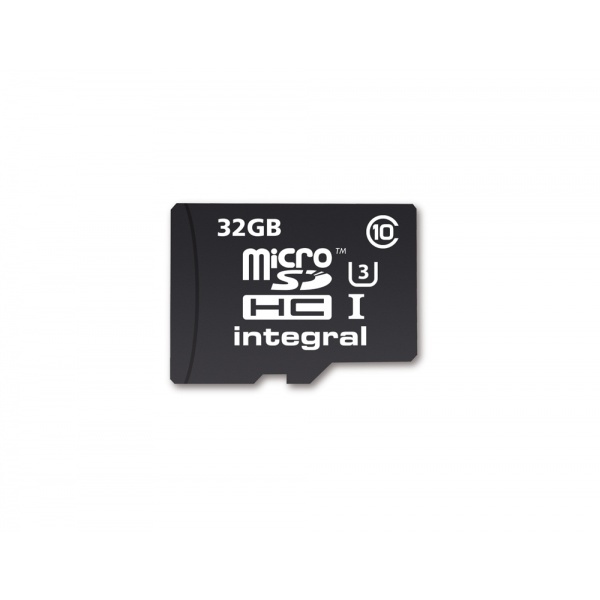 Our advanced chip-set delivers up to 90MB/s read and 45MB/s write speed; ideal for recording 4K, 2K, Full HD, 3D video and RAW and jpeg images.Benefits: Meets the demanding UHS-I Class 3 specification required for 4K video recording on Action Cameras 4K, 2K, Full HD and 3D videos and large RAW and JPEG photos can be saved to the Action Camera memory card at ultra-fast speed, with no lag or dropped frames Works brilliantly with 4K and Full HD action cameras (like GoPro®), smartphones, cameras, camcorders and tablets - ensuring smooth video capture even when shooting at 4K (3840 x 2160) and Full High Definition resolution (1920 x 1080) Class 10 speed also enables faster data transfer from microSDHC and microSDXC to PC/Mac (using a card reader) - makes photo and video editing much quicker and more enjoyable Supplied with an SD Adapter to provide a massive increase in the versatility of the microSDHC/XC card, now it can work in thousands of SDHC/SDXC Card compatible digital cameras, camcorders, card readers and laptopsFeatures: Performance tested with GoPro® Hero 4 Black High-speed data read / write, with up to 90 MB/s* read and 45 MB/s* write microSDHC/XC Class 10 UHS-I, Class 3 specification 5 year warranty*Up to 90MB/s read speed and up to 45MB/s write speed. Based on internal testing; performance may vary depending on host device.